Edmund Hedemann was born in Hawaii on 25 Dec 1886. Hedmann was a Phi Gamma Delta at Stanford University, graduating with an economics major in the class of 1912. Before he entered active duty, he was a clerk Castle & Cooke in Honolulu. 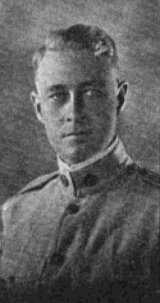 He died at Camp Dodge, Iowa of influenza-pneumonia.